Louis X (4 October 1289 – 5 June 1316), called the Quarreler, the Headstrong, or the Stubborn (French: le Hutin), was a monarch of the House of Capet who ruled as King of Navarre (as Louis I Basque: Luis I.a Nafarroakoa) and Count of Champagne from 1305 and as King of France from 1314 until his death. 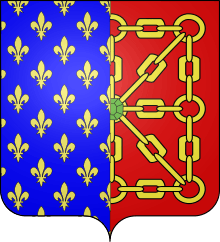 Louis was the eldest son of Philip IV of France and Joan I of Navarre. His short reign as king of France was marked by the hostility of the nobility against fiscal and centralization reforms initiated by Enguerrand de Marigny, the Grand Chamberlain of France, under the reign of his father. 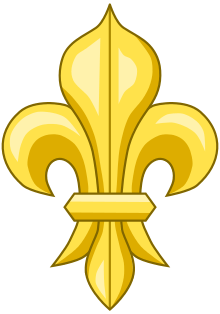 Louis' uncle—Charles of Valois, leader of the feudalist party—managed to convince the king to execute Enguerrand de Marigny. 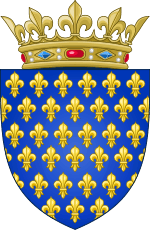 Louis was born in Paris, the eldest son of Philip IV of France and Joan I of Navarre. He inherited the kingdom of Navarre on the death of his mother, on 4 April 1305, later being crowned 6 June 1313. On 21 September 1305, at age 16, he married Margaret of Burgundy and they had a daughter, Joan. Louis was known as "the Quarreler" as the result of the tensions prevailing throughout his reigns. 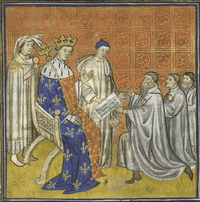 On the death of his father in 1314, Louis became King of France. Margaret of Burgundy died on 14 August 1315 and Louis remarried five days later, on 19 August to Clementia of Hungary, the daughter of Charles Martel of Anjou and the niece of Louis' own uncle and close advisor, Charles of Valois. Louis and Clementia were crowned at Reims on 24 August 1315. Louis' second wife Clementia was pregnant at the time of his death, leaving the succession in doubt. A son would have primacy over Louis' daughter, Joan. A daughter, however, would have a weaker claim to the throne, and would need to compete with Joan's own claims – although suspicions hung over Joan's parentage following the scandal in 1314. As a result, Louis' brother Philip was appointed regent for the five months remaining until the birth of his brother's child. The baby, who turned out to be male, lived only five days, until 20 November 1316—an extremely short reign for Louis's posthumous son, John I. Louis' brother Philip then succeeded in pressing his claims to the crowns of France and Navarre. Louis is a major character in Les Rois maudits (The Accursed Kings), a series of French historical novels by Maurice Druon. He was portrayed by Georges Ser in the 1972 French miniseries adaptation of the series, and by Guillaume Depardieu in the 2005 adaptation. ↑ The Low Countries and the Disputed Imperial Election of 1314, Henry S. Lucas, Speculum,Vol. 21, No. 1 (Jan., 1946), 79. 1 2 3 Jim Bradbury, The Capetians: Kings of France 987-1328, (Hambledon Continuum, 2007), 277. ↑ Christopher L. Miller, The French Atlantic triangle: literature and culture of the slave trade, p.20. ↑ Emmerson and Clayton-Emmerson, p.528. ↑ "Official website: Les Rois maudits (2005 miniseries)" (in French). 2005. Archived from the original on 15 August 2009. Retrieved 25 July 2015. ↑ "Les Rois maudits: Casting de la saison 1" (in French). AlloCiné. 2005. Archived from the original on 19 December 2014. Retrieved 25 July 2015.